More about the 25 Day Countdown, here. The video is beautiful, sensitive and fragile just like the song. Simply great and touching! The video is beautiful, sensitive and fragile just like the song. Great and touching! For me, the soul cages is probably one of Stings best....there is true emotion at play on this album. All This Time is a great song and video because not only is it fun and uplifting (due in part to the clever bass line) but also introspective feel. When I have a hard day, I sometimes wish I was on that boat. My favourite video is Desert Rose! All this time is a cool video, too! 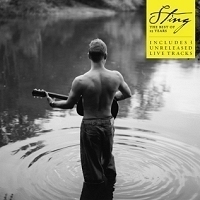 This song hands down is my absolute favourite by Sting. The only thing that could make this any better is for him to sing it in Portuguese. Sadly, I have never heard him play it in Portuguese in concert. Maybe before I die that will happen. In fact, I think I know that lyrics better in Portuguese than in English. Is that bad? Thank you Sting for your brilliant songwriting mind. Cool song, cool video. What else to say? So hard to choose...'Fragile' still moves my heart every time. Makes me want to hug my loved ones and be more compassionate to everyone I meet each day. 'We'll be together' has a playful Film Noir quality that is enhanced by the quirky characters Sting plays,and it always makes me smile..and I love the few loving glances he gives beautiful Trudie in the car at the end:) But ..if I HAD to choose ONE..it would be "Brand New Day" ..it's just so Hopeful and Refreshing...if I am ever having a bad day...that one revives me, and motivates me to have a 'Brand New Day' from the moment the video/song ends. Be Still My Beating Heart, so beautiful in black and white it is one of my favourite song. One of my favourites is Demolition Man. But it is wrongly uploaded on the VEVO app, it goes to If I Ever Lose My Faith. My favourite video is "we'll be together" in which we see Sting and Trudie together!! 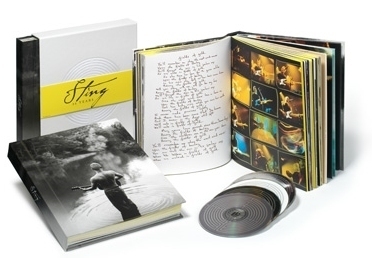 Sting embarks on his Back to Bass Tour throughout North America to celebrate the 25th anniversary of his solo career by taking it back to bass … all of the hits, stripped down, as they haven't been played in years. A limited number of Sting VIP tour packages are available for this intimate, not-to-be-missed theater tour. 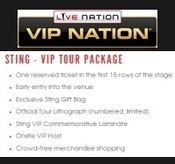 Packages include great seats, merchandise and more.